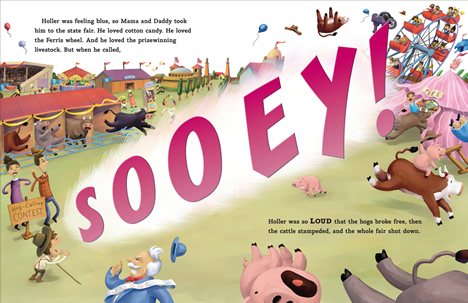 HOLLER LOUDLY by Cynthia Leitich Smith, illustrated by Barry Gott (Dutton, 2010)(OP). 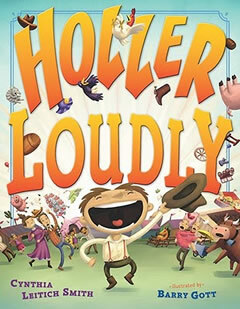 Holler Loudly has a voice as big as the Southwestern sky, and everywhere he goes people tell him to “Hush!” From math class to the movies and even the state fair, Holler’s LOUD voice just keeps getting on people’s nerves. But Holler can’t help himself—being loud is who he is! Will Holler ever find a way to let loose his voice—without getting into trouble? CLS: And I simply adore Miz Poofy, who’s mentioned in the story and shown repeatedly in the illustrations. …[The] public library was at the heart of the first draft, and I brought it back in—with a twist—to the final one. I’ll never forget turning to that last page and shouting, “Miz Poofy is the librarian! Miz Poofy is the librarian!” Of COURSE she is! But until Barry [Gott] showed me, I had no idea. —On Nailing the Kid-Friendly: Author Cynthia Leitich Smith With Lots of Art from Barry Gott from Jules at Seven Impossible Things Before Breakfast (Dec. 1, 2010). HVF: You and I are both primarily novelists. I’m curious as to how you approach writing a picture book, and how you feel about handing over your “baby” to an artist. CLS: Because my picture books tend to be character-driven stories (as opposed to, say, poetry or concept books), in many ways it’s much the same…. I love working visually, and I’m thrilled to have my text partnered with art. I consider a key part of my job to offer a stage for the illustrator to play on and then get out of their way. I feel that even more now that I’m writing YA graphic novels, which is an intrinsically more collaborative format. Then again, from Cornelius Van Wright and Ying-Hwa Hu on JINGLE DANCER to Steve Bjorkman on SANTA KNOWS to Barry Gott on HOLLER LOUDLY, and now Ming Doyle on my graphics, I’ve been blessed by having been paired with remarkable visual talents. Those folks raise up my words and heroes! BH: Character…. What does your main character want? And how long did it take you to clarify those wants? CLS: Holler wants to be accepted, but other folks (group antagonist) are put off by his loud voice. You see, Holler isn’t just loud; he’s so LOUD that the pecans fall from the pecan trees and the prickly pear cacti sprout more needles. So LOUD that every hound dog in the county rolls up his ears and tosses back his head to bay. He’s a tall-tale hero. Because of the chaos that Holler’s voice causes, tension builds steadily between him and the townsfolk. Even between him and his loving family. In the moment where all hope seems lost, he reflects that nobody else is being asked to change (and it’s not like the other locals don’t have their quirks). But then a threat looms from above, and it’s up to Holler to save the day. S. C.: Your word choice is lovely. For example, I liked that the tornado is blown into “a thousand sweet teeny breezy breezes—not one with an ounce of sass.” I like to accumulate favorite words and jot them down in my journals. Do you collect words or make lists, etc., prior to starting a book? CLS: Thanks, and you would think so! That’s an exercise I’ve encouraged my MFA students to embrace in their own writing. With HOLLER, it started as not a historical—not a tall tale, not nearly as rollicking of a story—so the language punch-ups came slowly over time. I do remember writing that line, though, and it never changed from the first time I keyed it out. It just felt true. Writing is like that sometimes. —Get Ready for Holler Loudly: an interview with Cynthia Leitich Smith from Shutta Crum (Oct. 28, 2010).